macOS High Sierra is pretty similar to Sierra, but there are plenty of under-the-hood changes. Here is how to upgrade your Mac. Apple File System (APFS) – The new file system is an advanced 64‑bit architecture which makes your Mac very responsive for performing common tasks instantaneously and also makes your data safe & secure. High-Efficiency Video Coding (HEVC) Support – Enables compression up to 40%. Metal 2 – Enables external GPU support as well as adds capabilities such as machine learning, natural language processing, and computer vision. Virtual Reality Support – Now, you can create VR content directly on your Mac. Photos Update – Revamped UI, new editing tools, and third-party integrations. Safari – New features such as blocking auto-play videos with sound, Intelligent Tracking Prevention, and so on. If you want to take a deep-dive into all the features, here you go! Can you Mac run High Sierra? If you have a Mac bought after late 2009, you are good to go! However, if you want to confirm exactly, check here. If you want to know your Mac model, click the Apple icon at the top-left and then select About This Mac. You will also need at least 2GB of memory and 14.3GB of free space. After you have confirmed that your Mac can run High Sierra, there is no need to wait! To check details about your Mac, click the Apple icon > About This Mac. Click on the macOS High Sierra banner displayed at the top or you can directly go to this link. Click Download. The file Install macOS High Sierra downloads to the Applications folder. The High Sierra installer file size is 4.80GB. So, be patient! The installer will automatically open when the download completes. Click Continue to start the upgrade process. You will be asked to select the drive on which you prefer to install and then restart to start installing. 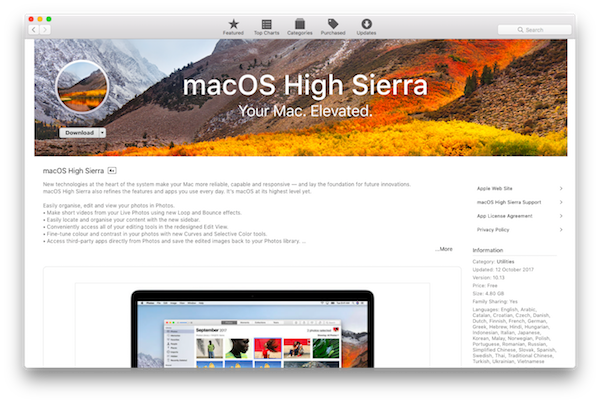 Go to Mac App Store > High Sierra page and click Download. On my MacBook Air. installation took nearly half an hour. But it may vary according to the model you use. If you want to know more about High Sierra, here is a visual guide.